Above is a map of the Greek Islands and the west coast of Turkey. 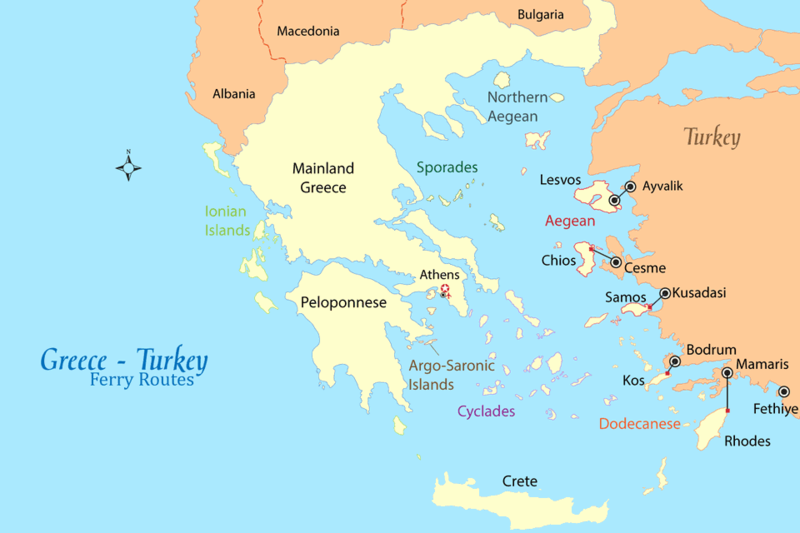 From five major Greek Eastern Aegean and Dodecanese islands can get to the Turkish mainland via ferry, as shown by the routes on the map. Some ferries run only during the summer tourist season, while others have a drastically reduced winter season. Note also that port taxes are astronomical. One of the big problems with chaining multiple ferry tickets (i.e Athens to Lesvos, Lesvos to Ayvalik) is that ferries might not run on days when winds are high. Some ferry companies will reschedule automatically. You should check on this. You can find general information on ferries from Aegean Ferry Services. Many tourists make ferry reservations on the run, stopping in a port city, going to the port or to a travel agent and booking a ferry trip. Aegean allows you to book online if you find that necessary in the heart of tourist season. If your destination is Turkey and you like visiting ancient sites, the Samos to Kusadasi route might be your best bet, as the extraordinary sights like Ephesus, Pamukkale, and Aphrodisias are easily accessible from Kusadasi. There is lots of lodging available in Kusadasi, and nightlife is lively. The Kos to Bodrum route is the second-favorite route. Bodrum, a modern resort town built on the ruins of Halicarnassus in 1402, features a 15th-century Crusader Castle (which now houses the Museum of Underwater Archaeology), an airport, lots of shopping, including a colorful market and a very lively nightlife. Enjoy the island of Rhodes, so the third route preference might pass through it. Fethiye is known for its beaches and yachting. The ruins of ancient Telmessos are scattered through the city. Ferries run mostly in the summer, from mid-June through August. Marmaris is an hour away from Rhodes Town by catamaran and two hours by normal ferry. It's an attractive tourist destination with architectural charm. The little port, fine beaches, and the Medieval Castle are the main attractions here. The Marmaris tourist season opens in April and ends in the middle of October. Chios to Cesme brings you to a pleasant sun and beach town with good beaches and good restaurants along the waterfront and along the main street. Cesme, Turkey is 85 km from Izmir, Turkey's third-largest city. Find out more about Cesme-Chios Ferries. The Lesvos (Lesbos) to Ayvalik, Turkey Ferries are more popular with Turkish tourists and those folks who like seaside resorts, but if you have a car you might think of some Turkish archaeology that's close. Within a short driving distance away from Ayvalık are some pretty well-known ancient sites: Assos and Troy are to the north, while Pergamon is to the east. Ayvalık also has two of the longest sandy beaches of Turkey. Enjoy your island-hopping vacation between Greece and Turkey!